September 12 marked the 16th anniversary of the arrest of the Cuban Five- men who went undercover in Miami to thwart terrorist plots being hatched by right-wing enemies of the Cuban Revolution. 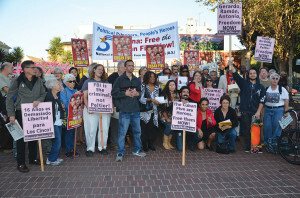 As protests demanding justice for the three heroes who remain in jail took place in cities across the country, world-renowned Cuban poet Nancy Morejón visited San Francisco to lend her voice to the chorus. After the action, Morejón performed a reading to around one hundred people at the office of the ANSWER Coalition. The reading included several pieces devoted to the Five, in which Morejón both celebrated the men’s heroism and tried to imagine the experience of their imprisonment, that have not yet been translated into English. Morejón and her translator then read pieces from Homing Instincts, a bilingual selection of Morejón’s work recently published in this country by Cubana Books. World-wide actions are taking place between September 4 and October 6. In Havana, three hundred delegates from 49 countries met for the X Colloquium: To Free the Cuban Five and Fight Terrorism. A picket at the White House and a Washington forum sponsored by the International Committee to Free the Cuban Five was also held.